and stitched, cotton fabrics, acid-free mat, conservation glass. Tumbling Blocks is geometrically simple but visually exciting. Each block is made of three identical 60° diamonds. Placement of light and dark colors gives the effect of depth and motion. Ancient Roman floor tiles and mosaics use the cube motif. 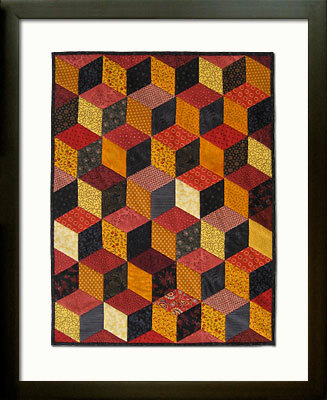 It appeared as a quilt pattern in the 1851 Godey's Lady's Book and remains a favorite of quilters today. In this piece the strong contrast of red, gold, and black produces a stunning staircase effect. Multiple planes of perspective add a dynamic and ever-changing visual feast, as 6-pointed stars or 3-cube structures seem to come and go.